For those who don't know Mantic Games: it's a new company, based in the UK. Their plan is to release a number of fantasy armies, compatible with every 28mm wargame. The first army is Elves. You can read more on their blog, or check out this video shot at GenCon 2009. I think Mantic Games introduces some very interesting concepts to the hobby, such as the boxes, the round bases which also fit in square bases and of course their fair price. Painters and gamers should keep an eye on this company, because I'm sure they will have a very bright future. The Elves are to be released mid-September, but I'm one of the lucky people to have received one of their pre-production moldings. Now first of all I want to stress these are test-moldings, so it's possible the final product will have some minor errors fixed and maybe some other little changes. Molding is done at Renedra Limited, the company which also produces the figures for Warlord Games. I can say the molding is very good, there are a lot of tiny details on the elves and they are very well defined. The figures themselves are well-proportioned and look very elvish, yet their slender shape is something you haven't seen before. The shape of the helmets, armor and shields make this army look unique. They come on round bases, but if you choose to base them on square ones then Mantic has come up with a very good idea: they provide with square bases in which the round ones can be fit in. Very clever! 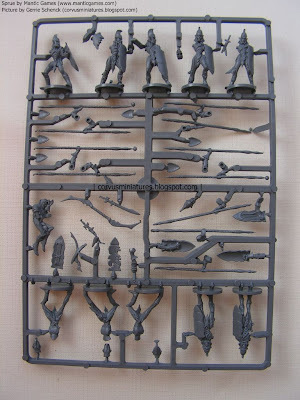 The sprue is full of many options, such as optional heads, shields and weapons. There's even some room left for additional details: a dead elf, a broken shield, a skull. Great stuff for dioramas or objectives for your games. So why don't you take a look for yourself? I have taken some pictures of the sprue earlier today. I couldn't resist to start working on those Elves, so I'm currently assembling this batch of 10. Check back in a couple of days for work in progress updates on this project. Thanks again Mantic Games, and best of luck! The sprue looks really good. I wasn't impressed by the first teaser photo from Mantic but this shows some great pose options.